I actually could not find such a chart, so I decided to learn how to use OmniGraffle Pro once and for all, and to produce it myself. I am not completely happy with it, but after 4 hours it does start to look good. I will update it in the future. Well, what is it? 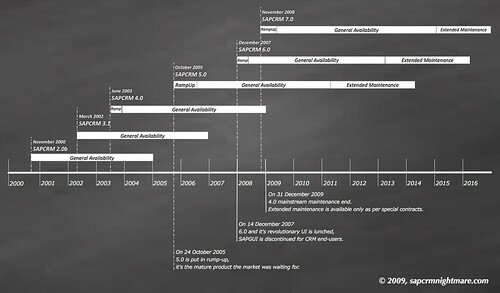 Just a timeline with the dates on which each SAP CRM release went into ramp-up, general availability, and when the maintenance end. Please note through years the release strategy and maintenance strategy changed and got more detailed. Below the actual source data, collected from SAP official product availability matrix, and for the old releases (previous to 4.0) from release notes and my faulty personal memory. Thanks for sharing. I always confused with CRM versions. It gives me a vivid picture about it. Thanks again. Very nice chart. A couple of things on the chart before version 3.1. There was no 2.1 release of CRM. I think the first release of CRM was 1.4, though no customers ever implemented it. Then 2.0A followed I think in the second half of 1999, but the first CRM customer only went live early in 2000. Then CRM 2.0B in mid-2000 I think(see note 324351). Not sure at all, but I think CRM 2.0c shipped towards the end of 2000. CRM 3.0 became available in mid-2001, although in ramp-up. Hi Johan, thanks for the info, I will update the chart and re-publish it. My memory betrayed me, I could not remember correctly the first version number I put my hands on, now you mentioned, I am sure it was 2.0c, not 2.1.